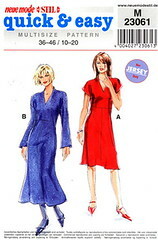 A knit V-neck, A-line dress with raised back neck with long sleeves or cap sleeves, back zip. Choosen as a best bet by Threads magazine author Patricia Moyes for Fall 2003/Winter 2004. See issue #110. I made a size 46(20) which corresponds to a bust of 104 cm or 41 inches. When I traced the pattern, my high bust was 41 inches. I’ve since lost weight, and my high bust is 39.75 inches. This may be part of my problems with this dress. A size 44(18) is for a bust of 39.5 inches (100 cm). Yes, except that I found the instructions for the inset corner confusing. Once I understood what they were talking about & showing me in the little picture, it was easy to do. LIKE: It’s easy to sew. I like the cap sleeves, v-neck, and long skirt. DISLIKE: A zipper? It doesn’t need a zipper. DISLIKE: It grabs my tummy, and I really don’t want to have that roll of fat grabbed. A rayon/poly/lycra knit from *surprise* Joann’s. I did an FBA and left the extra width in at the waist, adding same extra width for the hips. I left off the zipper. Next time, I’ll make the v-neck less deep; it’s really deep. I’ll shorten the skirt; it’s really long. I don’t know if I would sew it again. It’s easy to sew, and the bodice fits me well. I don’t think it’s as flattering as I would like my sewn things to be. I want people to exclaim, “You MADE that? It looks FANTASTIC!” Maybe a print would hide the tummy roll. I do recommend it, especially if you don’t have the tummy roll. It’s so easy to sew. It doesn’t need the zipper. It’s a comfortable, easy-to-sew dress.